The Fender Player Stratocaster is an affordable alternative to the Fender Stratocaster. The Fender Stratocaster is an American-made classic, played by guitar greats in just about every musical genre you can name. If you choose a Strat as your main guitar you are counting on a heritage that dates back to the dawn of the solid-body electric guitar, some 60-plus years ago. There is a reason this is among the most sought-after guitars in the world, and its sound and playability are tough to beat. In fact, if you really want a Stratocaster it’s likely nothing else will do. Unfortunately, an American Standard Strat comes with a price tag some guitarists just can’t swing. If you have the coins this guitar is worth it, but some of us have to find an affordable Strat-style alternative until we can afford the real deal. In this article you’ll find my recommendations on the best Strat-style guitars for the money, based on my own personal opinion and experience. I’m not going to tell you they are the same as an American Fender, but if you are looking for another option you might want to consider one of these guitars. It must live up to the expectations of a Strat-style guitar. Generally, we’re looking for hallmarks such as an alder double-cutaway body, a bolt-on maple neck with a rosewood or maple fingerboard, a vintage-style tremolo and a trio of single-coil pickups. It must be affordable. There is no point recommending expensive guitars here. Compared to some high-end guitars the American Stratocaster is actually a pretty reasonably priced instrument, but for the purposes of this article we’re going to look at guitars that come in roughly around half its cost. It must be worth it. These guitars aren’t expensive, but they are excellent instruments. I’d never recommend wasting your money on a sub-par guitar just to save a few bucks. You’d only end up disappointed. These guitars are good enough for performance and recording situations. So, read on to find out which guitars made the cut! Wait, so the best alternative to the Fender Stratocaster is the Fender Stratocaster? Sort of. 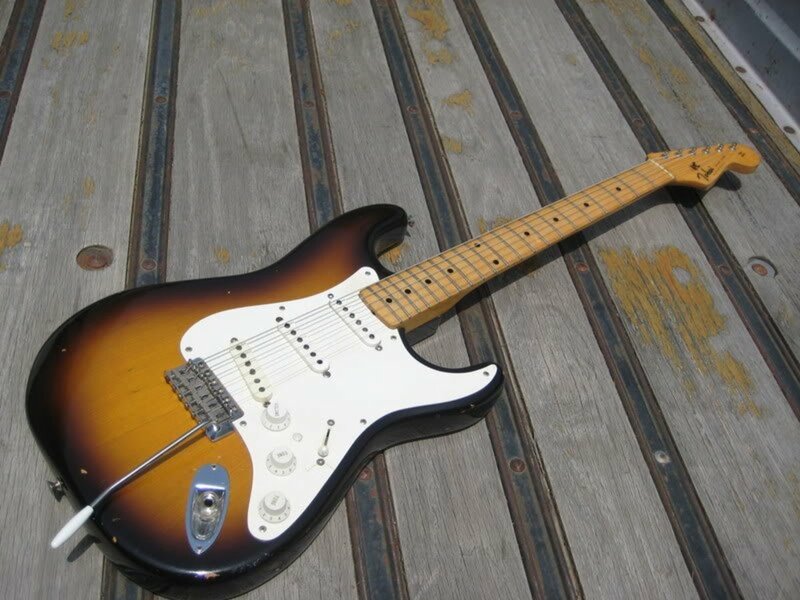 This is the Player Stratocaster, a more affordable version made by Fender in its Mexico facility. You’ll might hear it referred to as the MIM or Made-in-Mexico Stratocaster. It comes in around half the cost of its American namesake, and it’s one of the top intermediate-level guitars out there today. 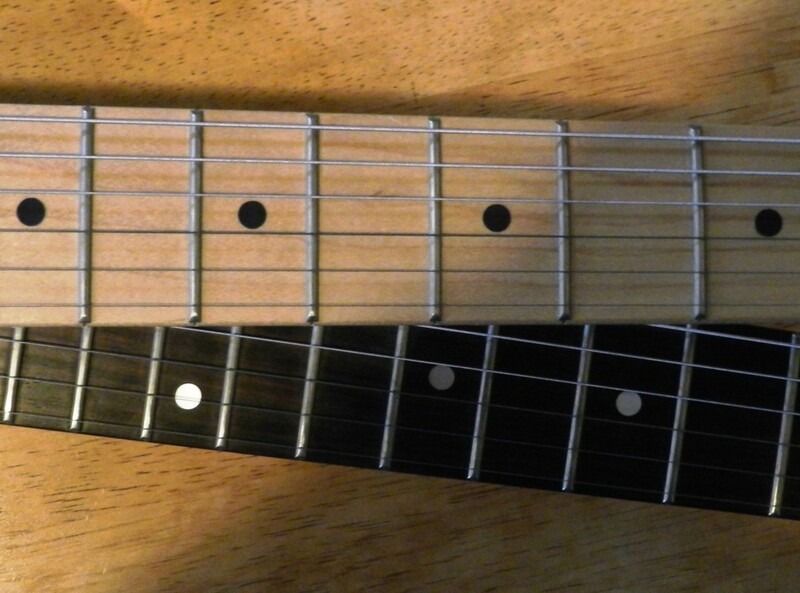 In fact, many pro-level players rely on their MIM Strats for gigging and even recording. 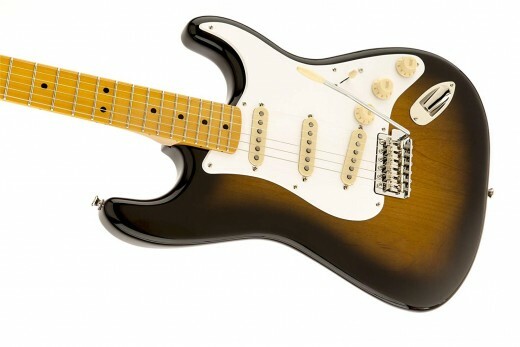 While you’ll find similar tonewoods and specs as in the American Strat, as you’d expect Fender manages to keep costs down by saving their premium woods and components for the USA models. That’s okay. MIM Strats might not be up to the same standards as a USA-made Fender, but they are very good guitars. The Player Series is even closer to American-made Strats than its Standard Series predecessor, with an extended fingerboard, improved pickups and two-point tremolo. If you are looking for a Strat-style guitar that doesn’t drain your bank account you may not have to look any further than Fender. G&L Guitars was spawned from the same great mind that gave us Fender instruments. That helps to explain why the G&L Tribute S-500 is such a popular guitar with Strat enthusiasts. The Tribute Series offers models that capture that vibe for a reasonable price. It might look traditional, but there are some very cool appointments here that will set the S-500 apart from other guitars in this review. It’s available with a mahogany body. This is a tonewood that's more resonant compared to alder. The pickups are vintage-vibe MFD (Magnetic Field Design) single-coils. The electronics feature G&L’s PTB system, giving the player improved control over bass and treble tones. There's also a push/pull switch that offers two more pickup combinations beyond the typical 5-way switch. For players looking for a classic guitar with some modern upgrades, the G&L Tribute S-500 might be the perfect choice. In fact, G&L instruments have converted many a Fender fan, and I know many readers will argue their merits to the bitter end. I think that, along with their unique design attributes, makes them the top option here, and least when it comes to guitars without the Fender brand on the headstock. I was on the fence about including the Pacifica here. It has many Strat-like attributes, but it also seems somewhat in a class by itself. In the end I decided it was worth mentioning for two reasons. It is super budget-friendly. This is guitar that's affordable for beginners, but it also makes a solid choice for intermediate players. Yamaha quality. Yamaha makes great gear at lower price points, and you can see that in the Pacifica. This is a great guitar for beginners or intermediate players. It’s versatile, and it has a reputation as a quality piece of gear. Yes, it meets the criteria we are looking for in a Strat-style guitar, but it also has its own vibe. In my opinion Yamaha makes some of the best acoustic guitars for beginners, and their electric guitars aren’t far behind. Depending on where you are as a player, the Pacifica may be the right guitar for your skills and wallet. Squier is Fender’s budget brand. Typically, they make lower-cost versions of Fender instruments. They offer some great beginner guitars, but a few of their models cross the line to intermediate territory. One of those is the Squier Classic Vibe Strat. There is a ‘50s version if you are looking for more or a vintage Strat sound. The ‘60s model captures that Hendrix/Clapton era sound, with slightly hotter Alnico V pickups, compared to the Alnico IIIs on the ‘50s model. 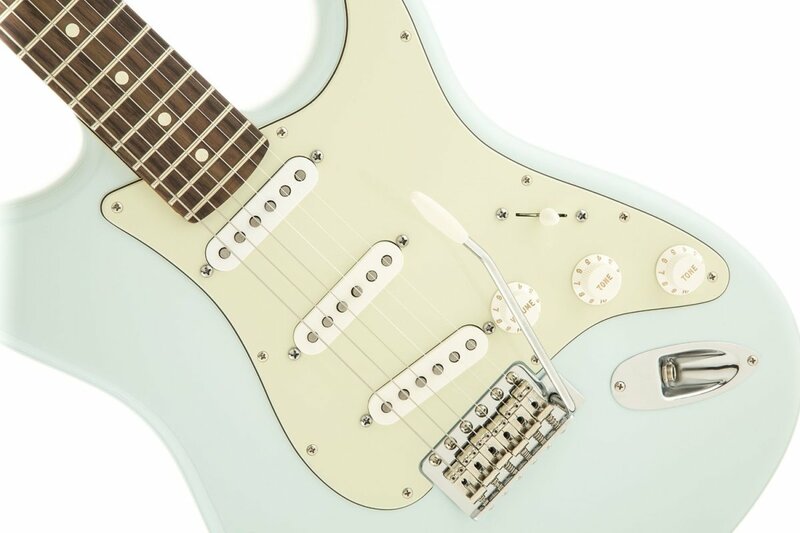 The Squier Classic Vibe Strat features everything we want in a quality Strat alternative: An alder body, a maple neck with the option of a maple (50s) or Indian laurel (60s) fingerboard, a trio of single-coil pickups, one volume and two tone controls with a 5-way switch, plus a vintage tremolo system. And, it is among the most affordable guitars in this review. If you are hung up on the Squier name on the headstock, you might want to get over it. Squier is a good guitar brand, and while they still make gear for newbies who can’t yet play a chord, they also make some good stuff for those of us who have been around a while. 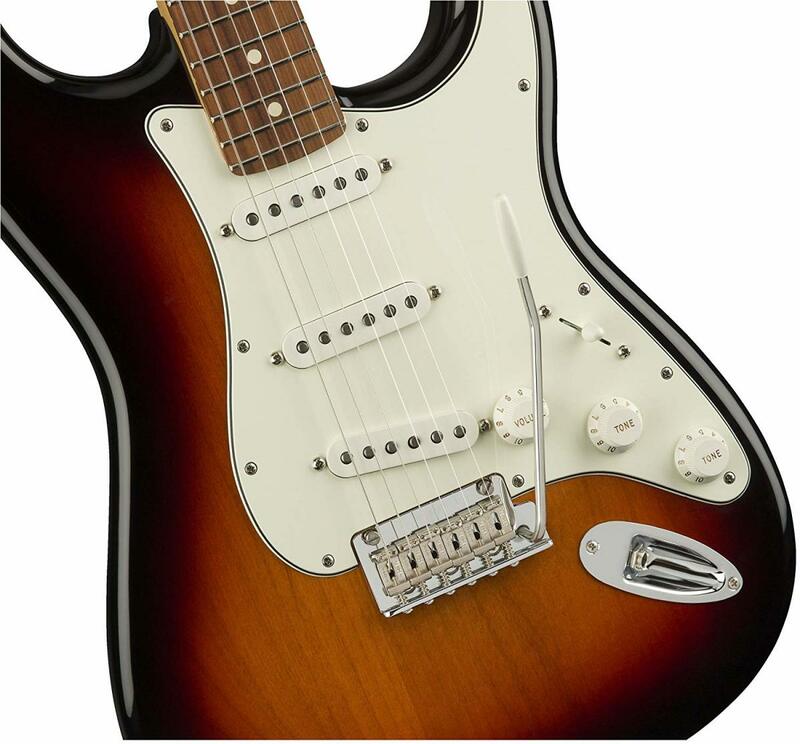 The Classic Vibe Strat is one example of just that. You probably don’t think of Ibanez when you think of Strat-style guitars, unless we are talking about superstrats. This is a guitar company that has made its mark in the metal and hard rock world. Their S-Series guitars are hot, sleek and fast, and a favorite of shredders across the globe. So, what happens when you take an Ibanez S-type guitar and keep all the shreddy bits but substitute three single-coil pickups and a standard tremolo system? You get the SA130. 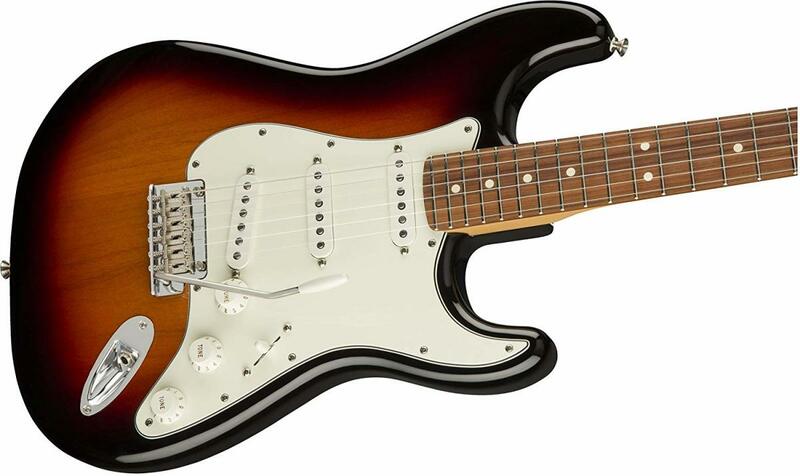 Strat purists may scoff here, but I think this guitar is a great choice for players who like the feel and construction of a modern super-strat, but prefer classic tonal choices. So, you’ll see a thin mahogany body and fast Ibanez neck along with single-coils and a 5-way switch. In many ways it’s the best of both worlds. Even though Ibanez started out making copies of famous guitars many years ago, today they are a brand that doesn’t need to take the lead from anyone. Choose this guitar for its own merits, and because it meets your needs, not because of how closely it resembles something else. There is also a HSS version (SA160) if you are not quite ready to deny the shredder in you. Kiesel/Carvin Bolt Classic: I love Carvin guitars, which now go by the brand name Kiesel. They are custom-built instruments available by order, and they really come through when it comes to quality and design. The Bolt is a great instrument that will scratch that Strat kind of itch, and it is one of the more affordable options in the Carvin catalog. Charvel Pro Mod So Cal: For me, Charvel guitars are the ultimate in Super-strat shred machines. In the So Cal you’ll find a hot-rodded Strat-style guitar with powerful humbuckers and a Floyd Rose tremolo system. If you are looking for something made for metal but you still love that Strat vibe, this might be the guitar for you. Godin Progression Plus: Godin is a Canadian company with some really innovative ideas. This is the same company that brings us the Seagull brand, of which I am also a huge fan. The Progression Plus is a guitar that captures some classic looks and sound from a unique approach. The Seymour Duncan JB Jr in the bridge is an especially cool touch! When it comes to the best Strat-style guitars you have a lot of choices. You’ve read about my top picks in this article. Now it’s time to get out there and do your own research and decide for yourself! You may find the perfect guitar from some brand not even mentioned here. Or, you may throw up your hands and decide to take the plunge on an American Stratocaster after all. G&L offers a great option for Fender refugees who want that classic look and sound, but also want just a bit more. G&L guitars come from the mind of the man himself, and that alone means a lot. Good luck with whatever you decide. I hope this article help you get a little closer to landing an affordable Stratocaster alternative. Your Opinion: Which is the Best Strat-style Alternative? Which guitar will you choose? I have owned several Strat copies; some I have now. I have three "pre lawsuit" Strat copies...two Tokai from Japan and a German left handed Hohner ST57.